So, it’s been a little while since we’ve had a proper blog post, hopefully you’ve noticed some of the minor updates over the past nine months. Earlier today we released a few key features and updates. 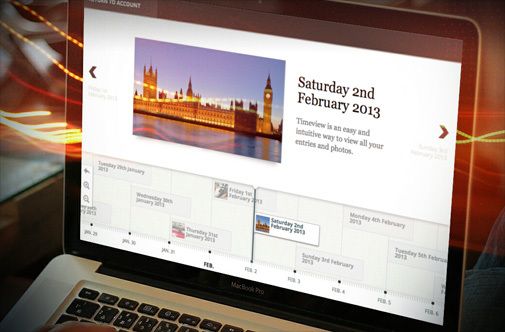 PRO users now have an exciting new interface for navigating through their entries. It’s a really easy and intuitive way to look back through your entries and is especially good if you have lots of photo uploads. To preview it in action you need a minimum of three entries, you can find in by navigating to View Entries -> Timeview (PRO). You may have noticed the look and feel of 280daily has been subtly enhanced. If you’re not a fan of the new look, you can switch back by navigating to Settings -> Themes and selecting “Classic”. 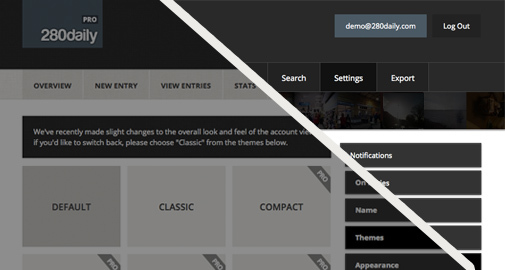 There you’ll also find a number of PRO themes, that provide greater contrast and additional design features. Along with all that, you can now view the recent login activity of your account. This gives you the ability to sign out of all other locations for peace of mind. Useful if you’ve logged in at a public location and forgot to sign out. To access your activity log, scroll all the way down and bottom right of the footer you’ll find a link to your “Recent login activity”. The data is available for 2 days for non-PRO users and 30 days for PRO. Failed login attempts are also recorded on PRO accounts.